Ever look around your office and wonder where everyone is? Hot-desking, remote working and collaboration have all become common place in the modern work environment. In order for people to work efficiently and effectively, a modern suite of tools have been developed for helping with collaboration in way that is familiar and user friendly. Instead of a pile of internal emails back and forth and people getting CC’d into conversations that don’t include them, these tools take ways of communication that we’re used to from outside of the office and repurpose them to suit the business world. One of the early starters in this trend was Yammer, a social network designed for internal use only. In its earliest form, Yammer was a lot like Twitter and Facebook, where you could tag someone in your corporation to involve them in different conversations and post updates about what you’re doing. Since Yammer, a host of services have been brought to market that promise to be better, smarter and all in all easier and more accessible to use, making productivity easier to achieve with a fragmented team. What Makes Facebook’s Offering Different? 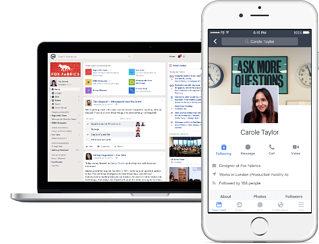 Facebook’s WorkPlace product allows companies to have access to most of the popular features of the traditional Facebook, including live video and private messaging. The difference is that Workplace is aimed at enterprise level big corporations, giving them the ability to broadcast company news globally, throughout the company. Compared to its competitors, Facebook’s Workplace is a full service behemoth aimed at companies with thousands of employees across multiple countries. Rather than focusing on a core functionality, say allowing people to communicate in a shared chat room, Facebook have created a suit a tools dedicated to making large companies feel smaller. It’s an attempt to break down the communications barriers that large corporations can often encounter. By incorporating Facebook Live, Skype, Instant messaging and Facebook features such as groups, walls and profiles – they are trying to become a one stop shop for your internal communications needs. All of that comes at a cost however, charging $3 a month per employee up to 1,000 employees and $2 per every employee after that. It means that it will be accessible to small to medium companies, but it’s only really worth it if you’re going to take advantage of most of the features. There are free alternatives that smaller companies may want to consider. Slack was a start-up, which means their product offering is lean and is hyper focused on one particular factor, and they did it well. When you boil it down, Slack is a dashboard for private chat rooms. You can set up a chat room around a particular client, project or campaign and then add the relevant employees into that room. Once set up people can collaborate in the chat rooms via instant message and @mention people like on Twitter. What Slack have done well is add integration with other services. 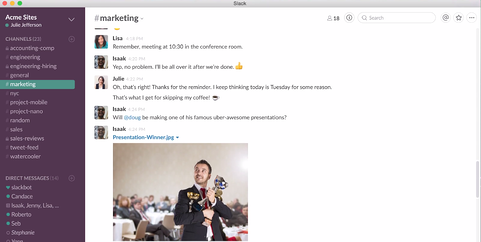 Once you have your Slack set up, you can add services such as Video calling, Google Drive and DropBox. There’s a comprehensive list of the best Slack integrations here, as well as how to install them. The best thing about Slack is that it built solid foundations for itself and then added integrations of “best of breed” apps, rather than trying to build them all itself. Oh, also, it’s starting package is completely free. Are you considering a tool such as Slack or Workplace to make internal communications and collaborations easier? Maybe you’re already using Slack, if so, let us know how you’re using it by contacting us via Twitter, or on our website.